Islamic menace all time high at Katas Raj temple in Pakistan. Pak Supreme Court objects. Pakistan: Shri Ram and Hanuman idols missing from Katas Raj temple. Vamandev Parmar | HENB | Islamabad | Dec 14, 2017:: The Supreme Court of Pakistan expressed shock when it came to learn that the idols were missing from the Hindu temples in Katas Raj temple complex in Chakwal. 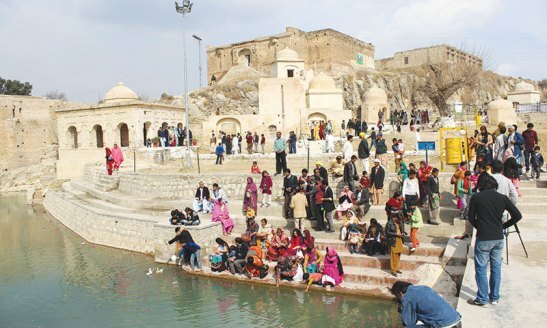 The reigning Islamists in that area usually desecrated Katas Raj temples so that the devotees would stop their pilgrimage the age old Hindu shrine. The pilgrims who visited the holy site had to bring their own idols to perform their rituals. The Supreme Court has sought an explanation from the Evacuee Trust Property Board (ETPB) over the absence of idols. According to the Dawn+, a three-judge bench headed by Chief Justice Mian Saqib Nisar also ordered to close the tubewells used by a cement factory, which is believed to be one of the industrial units responsible for the drying up of the Katas Raj pond. Katas Raj is the second-most sacred Hindu site and dates back to 600 AD. The temple complex is built around the pond, which finds it origin from Katak Shah, which in Sanskrit means ‘raining eyes’. The pond is believed to have been formed from the tears of Shiva after the loss of his wife, Sati. The Supreme Court bench is conducting a suo motu hearing based on media reports that the Katas Raj pond is drying out due to water consumption by nearby cement factories. One of the judges on the bench expressed dismay as to why the authorities could not protect the idols inside the temples. There are two temples within the premises of the Katas Raj — Hanuman temple and Sri Ram Mandir. Hindu minorities are deprived from their religious rights in Pakistan and have been facing brutality by Islamists in many ways. Pak SC orders Punjab Gov & cement factory to refill Katas Raj pond in a week. Vamandev Parmar | HENB | Islamabad | Dec 14, 2017:: Chief Justice of Pakistan Supreme Court, Mian Saqib Nisar ordered the Punjab Government in and the Bestway Cement Factory as well on Wednesday to refill the Katas Raj pond within one week, during the hearing of the suo motu case on the depletion of the pond located at the site of Hindu pilgrimage in Chakwal. The historic pond is said to have depleted due to the presence of nearby cement factories which have sucked out the underground water. It is alleged that the culpable Bestway Cement Factory is unlawfully encroaching the areas of Katas Raj shrine area and polluting the environment of age old Hindu pilgrimage to destroy it completely in order to take the areas under the cement factory. Earlier on December 13, the Supreme Court of Pakistan expressed shock when it came to learn that the idols were missing from the Hindu temples in Katas Raj temple complex. The Supreme Court had sought an explanation from the Evacuee Trust Property Board (ETPB) over the absence of idols. Though Pak Supreme Court now objects for the Islamic menace at Katas Raj temple in Pakistan, the Islamic menace in Pakistan all time high against the dying Hindu minorities there. This entry was posted on December 14, 2017 by hinduexistence in Conspiracy against Hindus, Hindu Minorities in Pakistan, Hindu Persecution in Pakistan, Hindu Tradition and Culture under attack, Save Pakistani Hindus, Save Religious Minorities in Pakistan, Stop Attack on Hindu Temples and tagged Bestway Cement Factory, Hanuman idols missing from Katas Raj temple, Islamic menace at Katas Raj temple, Katas Raj -- Hanuman temple and Sri Ram Mandir, Katas Raj Shrine, Pak SC orders cement factory to refill Katas Raj pond, Pak SC orders Punjab Gov to refill Katas Raj pond, Pakistan Supreme Court, Shri Ram and Hanuman idols missing, Shri Ram idols missing from Katas Raj temple.